This year in summer Death came right inside our home and carried off our precious 18-year-old cat. She had a hundred names this black-and-white ‘hunka hunka burning love’, as Frances would call her. She was ‘Fluff the magic kitten who lived by the sea’. She had nonsense names like ‘Wuff-a-doodle-woodle-poodle’; names like ‘Boombah’ for when she grew fat; sly names, heroic names, grandiose names, and secret lovey-dovey names whispered in the dark to the soundtrack of her gravelly purring. She was the Tom Waits of cats. And ‘the sun shone out of her date’, as Frances used to say. From kittenhood to adulthood, through to disability and death, we were her companions, and she ours. Then we became her carers. Those were the hard yards, but, at her worst she was at her best, and she made us be better than we were. Like me, Fluffy had chronic disease to contend with—in her case, crippling arthritis and failing kidneys, both common in senior cats. Both diseases are cruellest at the end. I lay with her lots in her last two days. She was on a pillow on the bed beside where Frances slept. Arthritis had made walking an ordeal. It had rendered her barrel-chested and had disfigured her paws—the once jaunty black smudge on her toe now sat atop a knot of twisted bone. But she was content to snooze in the morning sun and wake and watch the shadow play of leaves and birds on the yellow wall. And snooze some more as rain fell and the frogs rutted under dripping palms. She would lift her velvety black nose and smell the browning butter when pancakes were on the go in the kitchen. 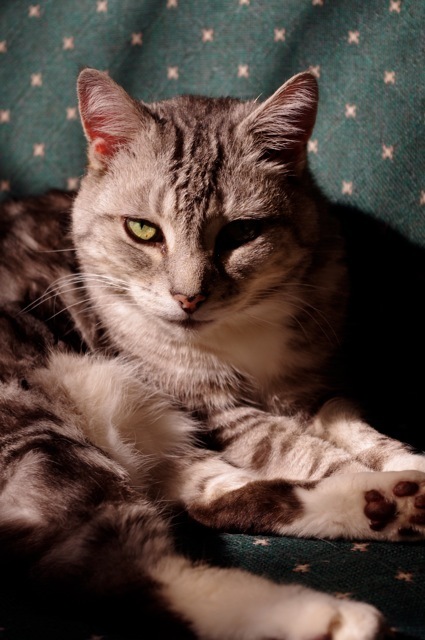 Cats don’t complain about pain—they don’t express it—so it is even more humbling to see these stricken creatures both so courageous and graceful. A sigh is the only clue, or a soft growl when the pain or thirst or stiffness become too much to bear. Tending to Fluff, tempting her with treats, holding a glass of water to her always thirstily lapping tongue, these were as nothing when rewarded with her good spirits. She would rally. She was a stayer— well into her nineties in human years. As her kidneys failed she needed to drink copious amounts of water. We had to keep her hydrated, but we knew the creeping tide of toxins would one day prevail. And yet still she chirrupped joyfully at us and settled down on her pillow in a cat’s kow-tow, Queen Fluffy, serene, mysterious and restful. Her mere presence a sleeping draught. In the end, she needed to be groomed, washed with a cloth and brushed gently because she was too stiff to lick that place from whence the sun shone. It was a privilege and the once proud feline demurred. If you must . . .
We knew it was coming when she growled as she walked. She was angry with the pain, snapping at her unseen tormentor. When Fluffy stopped purring, Frances felt her spirit had gone. Our vet agreed it was time to let her go. On February 11 she slipped away, leaving behind her sister, my beloved Tiggy. Tigs raged against the dying of the light until she surrendered on her own timetable. More kidney disease. More arthritis. We were, as anyone who has been here knows, exasperated by as many as 8 different Fancy Feast tins open at once; pills that cost hundreds of dollars thrown up. We watched her waste away to three kilos and were delighted when she put on 100 grams. She was six kilos in her prime. She takes a long time to get comfortable, to fold under the throbbing front paws that are so like tiny crippled hands. We make sure she is warm but every night she leaves the heater and seeks out my lap, this once independent minx who would flounce from the room with a swish of her stripey tail. She is still purring, still hydrated, still alert, still engaged, still going to the toilet, still wanting to sit on me at night, yet the time has come. I know and she knows and I weep and she bunts me with her head, oddly large and noble on her now wasted body. She is tiring; tiresome even. When she cries out for the 16th time and will eat nothing but lark’s tongues in aspic, I am grumpy. She cannot hear me grumble because she has gone deaf. But she can meow loudly. She hates the pain meds I force down her throat, but she cannot struggle and scratch as she would have, this once wild, green-eyed silver tabby that slew rats as big as cats. She looks at me in bewilderment. Why would I persist in giving her these tablets that cause her sides to heave? She turns her face away. I am ashamed. The day is coming soon, we know. And she tells me with her limping leg and weary sigh that she has had enough. And I tell her that I can let her go although it will be the hardest thing since . . . well since forever. And even though she cannot hear, I play the Overture to The Sound of Music because there was a time she would mewl loudly whenever she heard Julie Andrews go to the hills when her heart was lonely. Perhaps it bothered Tigs. Like the harmonica did. Deaf is deaf. This is for me, not her. I take the needle off the vinyl. I remember silence is the language of God. And I just move close to her and fall to my knees and bury my face in her sweet-smelling, warm, soft, silvery white fur and thank her for all the love she gave me. June 21, 2014 dawned bright and blue and ended wretched at the little grave mound in our backyard under the tree ferns near the bird bath where we buried Tiggy aged 18 years and 8 months, next to her sister Fluffy aged 18 years and 4 months. And that is how the shortest day became the longest day. This entry was posted in Uncategorized and tagged arthritis, blog, carer, cat, chronic illness, CKD in cats, COPD, Currarong, Death, Emphysema, kidney, Nowra, pain, pet, The Sound of Music. Bookmark the permalink. Thank you Bill. You are I’m sure a man who has had animal companions. It would have been very hard to hit the “Like” button for this. I nursed 2 beloved dogs in their 14th years till they moved on. My first dog, Patch, died with diabetes & heart problems, I had to give him daily shots of insulin & monitor his sugar by following him outside in the morning & holding a cup under his lifted leg. He was blind from cataracts before we had the right diagnosis. Towards the end he loved to lay on my feet while I reclined on the couch or on the floor right below me. He would cry as he wandered from room to room trying to find me when I had to move away to the bathroom. My beloved Bandit succumbed to heart disease & arthritis. Towards the end, we had to lift our 80 lb. Rottie into or out of the car or onto the bed. He slept most of his days away towards the end. In both cases, my hubby at the time was too overwhelmed to be the one at the vets office with our beloved pets, so I had to be the one whispering in their ear as they went to their final sleep. I can no longer have pets because of my COPD & as much as I miss having a dog around the house, I don’t think I could go through it again or be the one to leave this time. Your cats sound lovely, I’m sorry you are missing them. benzeknees, hello and thank you for talking about your loss here. It can be very demanding (and costly) at the end, especially if you’re not in good health. There are so many animals needing homes, even old animals, that I think I’ll adopt one when some time has passed. For now it’s nice to be free. But life is emptier, duller, sadder without them. It’s nice to share my grief with people who understand. Barbara – A beautiful tribute to your two life companions. It seems you and Francis are like Tom and I in that we take a pet in and love it from day one until long after the last day alive. Our pets made every move we did. Many in my line of work abandoned pets as they moved from one site to the next but I’d ask them, would you leave your children behind? Tom and I both love cats. He’d never had one until we married. About three years ago we lost all three of our cats within a three month radius. We were heartbroken over and over as you and Francis are now. Hello my friend. How wrenching to lose all three in three months. Doesn’t it leave a gap? 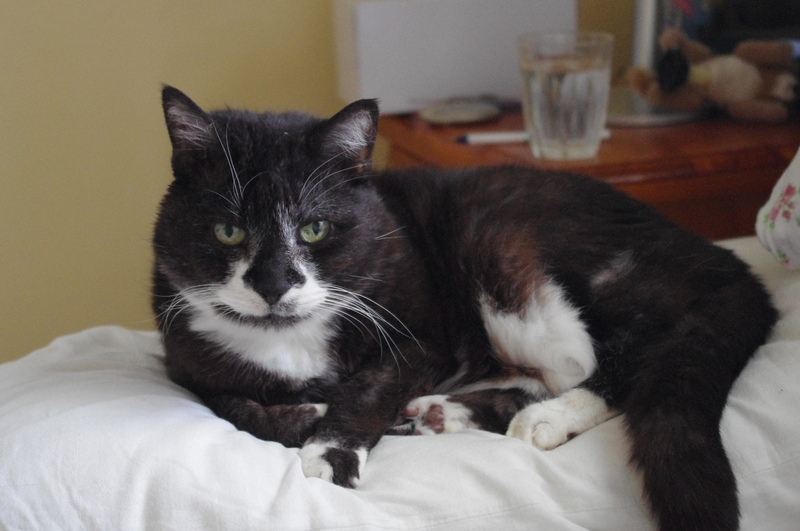 Would you think of adopting an older cat for Tom? And you. We re trying to get away a bit – measure how far I can go and what I can do, so no more cats for now. But my life has been so enriched by my felines. Sheri, I think of you often and hope you are travelling ok. And singing.